Kitchen inspiration from Eric Olsen Design. In designing homes for our clients, our intention is that the initial material selections serve as a strong canvas upon which spaces will come to life through furniture, fabrics, artwork and accessories. Currently, the biggest trend in wood seems to be natural woods - walnut, teak, pine (natural/medium color & lighter woods) and black wood with upholstery. Before this trend, wood seemed to come only in light and dark with little variation. 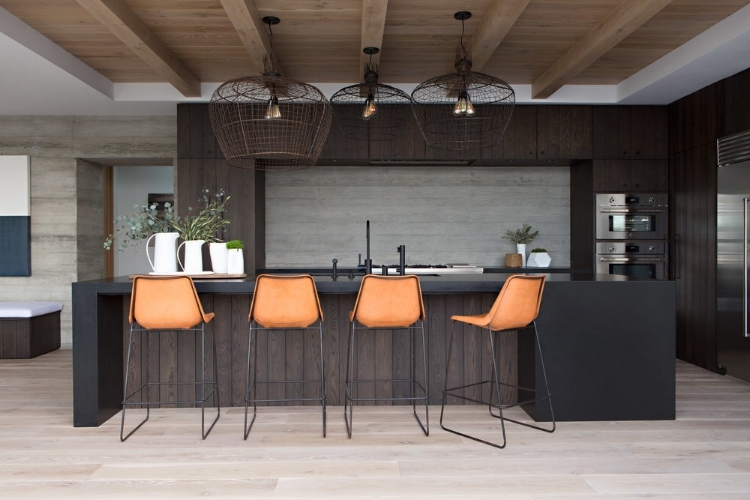 The weathered wood began with furniture and accessories and has moved to flooring, even going as far as being replicated in tile form; and then there’s the raw movement- wood with more natural texture than the smooth, highly-polished woods of years ago. There are a few looks trending right now which we noticed at market that are a throwback to the ’70’s and 80’s. The first being the bohemian look which is big! Macrame, hand glazed pottery, florals and ethnic textiles, the embodiment of a look from a long lost decade. Also, shabby chic/cottage - painted white, aged or vintage-looking furniture & accessories have come back with a zing! Bohemian inspiration courtesy of Design Manifest via Pinterest. Another trend we’re noticing is the use of mixed metal finishes as a very bold statement to a home’s interior. Gold, nickel and raw iron can be a charming accent to a country farmhouse or a streamlined contemporary interior, depending on what design direction is taken. Antique brass and even rose gold are being used in everything from furniture and accessories to plumbing and lighting fixtures. In addition to these latest finishes in combo or on their own, is the unapologetic use of matte black and gunmetal, giving an overtly substantial feel to any space. Brass light fixture by Ryan Bloum- Instagram: @luminair_lighting. Minimalism can be made to feel a little warmer through the use of furniture in organic shapes combined with textured elements like oversized tile and stone, book matched marble and quartzite. Even the classic look of clean and bright whites can be elevated to new heights through the introduction of crown and paneling combined with antique mirror or sophisticated wall coverings. The artistic “zing” of porcelain tiles used in floors, walls both inside and out is a welcome trend that is easy to care for. Kitchen inspiration via Harbor View Hills project by Eric Olsen Design. Once the initial materials are in place, a homeowner has the freedom to express their own creativity through accents which can be modified and updated according to the latest movement in home design. Our forecast for 2019 gives homeowners a vast range to choose from depending on their personal taste. A soft tribal look that is rich in texture is showing up everywhere from family living spaces to children’s bedrooms. Geometric prints which we’ve been seeing in tile and backsplashes are now showing up in wallpaper and pillows. Nubby and organic rugs and textiles in bold prints offer a punch of color, and believe it or not, fringe has made a comeback. We’re predicting an artistic approach to interiors that conveys a comfortable collected feeling without a tendency to replicate any particular era in full. In shifting to an autumn color pallet it’s as simple as adding some fabrics in the trendiest colors for this fall: dusky blues, spicy reds, earthy greens and taupes. By adding pillows and throws with some foliage in an oversized vase, you have set the tone for the coming season. Voila! The Eames Chair- How A Molded Plywood Chair Became An American Icon.